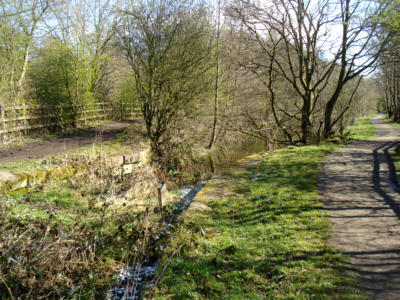 At the top of the fourth lock in Daisy Nook, the Fairbottom Branch leads off to the right, running eastwards for half a mile to Bardsley Bridge. 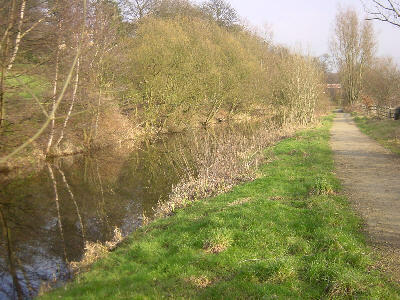 The towpath runs along the south side. 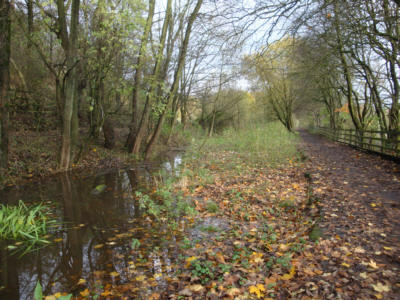 This virtual walk now follows the Fairbottom Branch to its end. 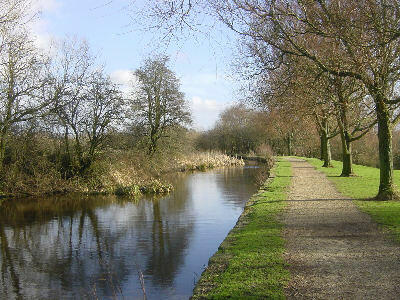 A short distance from the junction, the canal widens on the far side. This area was once a loading wharf for coal from Wood Park colliery, which was brought by wagons on a tram road. Waterhouses Junction. 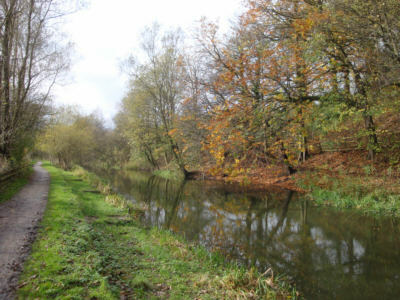 The Fairbottom Branch goes to the left; the locks straight ahead. 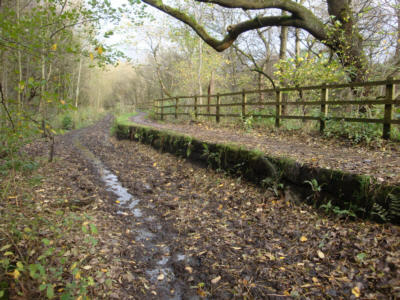 The lowered towpath edge shows where a wide spillway carried surplus water down to the River Medlock. 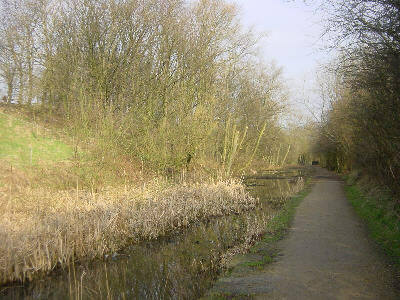 The towpath of the Fairbottom Branch crosses the site of the fourth lock, near the spillway, and curves away to the right, heading towards Bardsley. On the right are views down over Sammy's Basin. Just around the curve is a wide area of water. On the far bank a stone structure is visible in Winter. This was the base of a coal tippler at the end of a tram road from Wood Park Colliery. Waggons tip coal into into waiting boats. 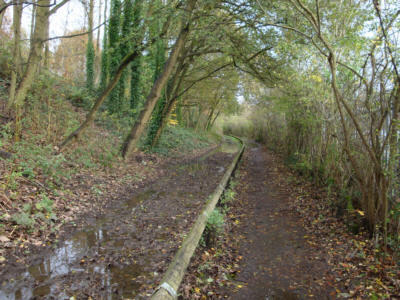 Looking east along the Fairbottom Branch. 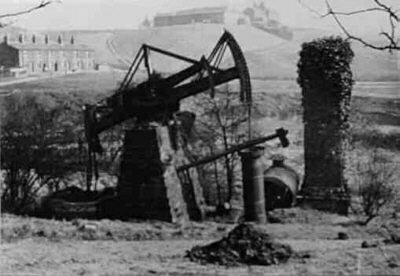 The pumping station stood on the grassy slope to the right. 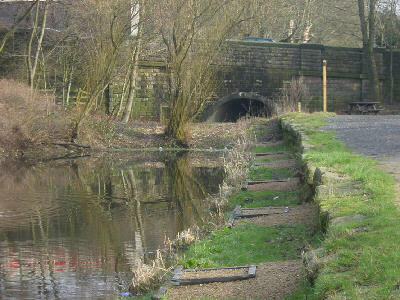 water was pumped into a channel which ran under the towpath to a spot marked by a larger than normal stone on the towpath edge. Looking west along the Fairbottom Branch. Narrows where stop planks could be placed in the event of any breach of the aqueduct or steep valley side. Looking east towards Valley Aqueduct. Looking east along the Fairbottom Branch. The canal soon crosses Valley Aqueduct, overlooking Valley Farm. The steep road running below is very quiet and it is hard to believe that this was the main road used by coaches and wagons between Oldham and Ashton before the present straight road across Bardsley Bridge was built. 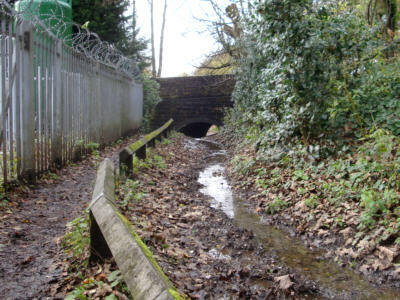 The section of canal across Valley Aqueduct is currently dry. Shallow infilled section beyond Valley Aqueduct. Looking back towards Valley Aqueduct. Another narrows here, where vegetation is affecting the stonework. 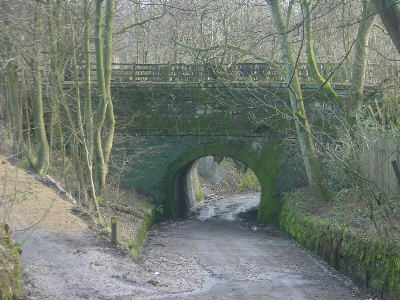 Bardsley Bridge, across the Fairbottom Branch. 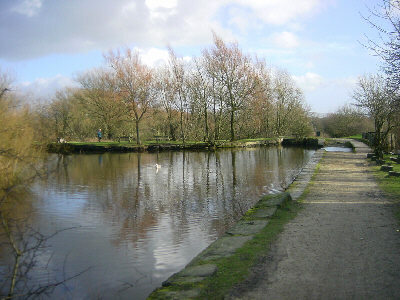 Bardsley Bridge is the end of the part of the canal that is in water. 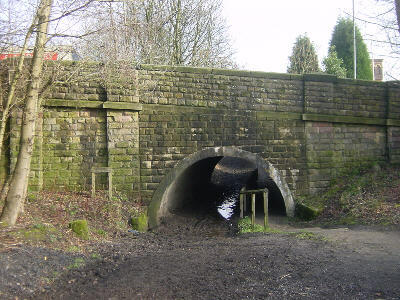 The canal bed through the bridge is in use as a bridle way. The navigation beyond the bridge was closed in 1904. 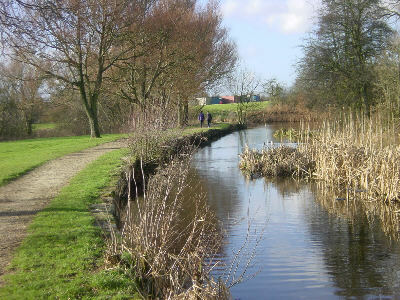 Mining subsidence meant that Bardsley Bridge became lower in relation to the canal's water level. 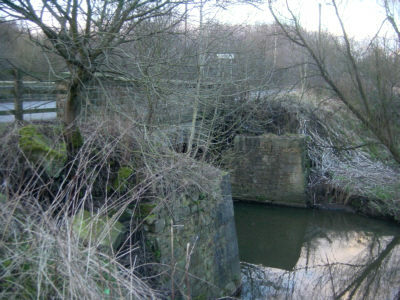 As the collieries further along the valley had closed, the bridge was not re-built and the canal east of it was abandoned. A footpath now follows the remains of the canal beyond the bridge for another 400 metres to its terminus at Fenny Field Bridge. 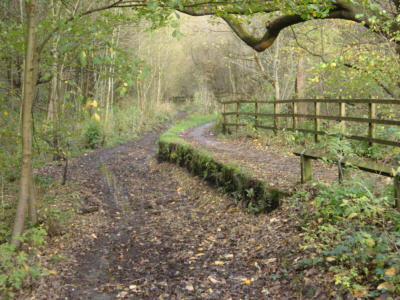 A tram road led from here along the valley to coal pits at Fairbottom and Rocher Vale and the iron works at Park Bridge. Looking back to Bardsley Bridge, giving an idea of the effects of subsidence. 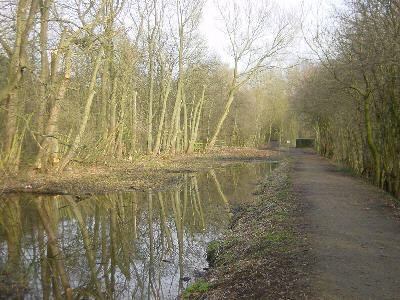 A bridle way and footpath follow the narrowed route of the infilled canal. 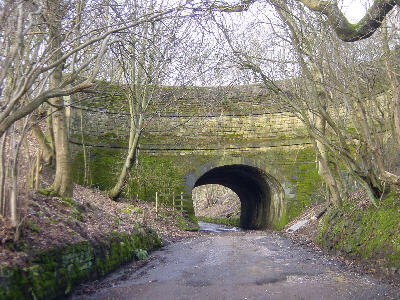 Looking east along the Fairbottom Branch route. 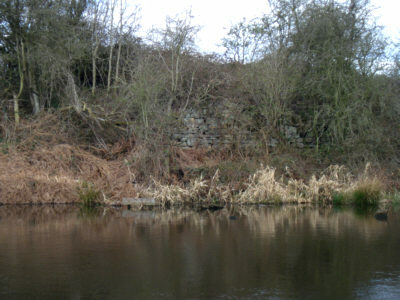 Sections of towpath wash wall are still visible. The canal terminated just before Fenny Field Bridge. 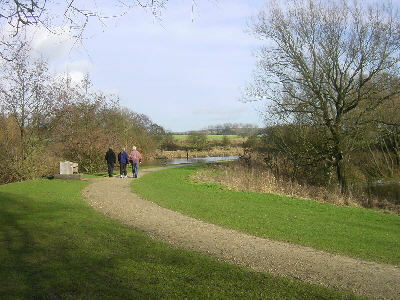 The footpath on the left follows the course of the towpath. In the last 200 metres of canal there was a winding hole, a loading wharf, three tramways from coal pits and a dry dock. A tram road ran from the canalside, across Fenny Field Bridge and up the valley to Park Bridge and Rocher Vale. 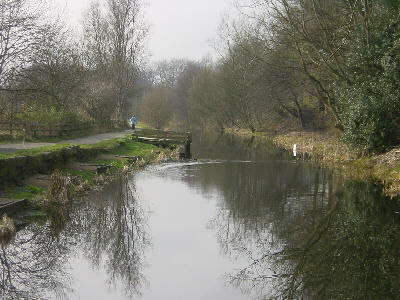 The piers alongside the bridge carried a channel that brought water pumped from Fairbottom Pit to top up the canal. A tram road ran from the canalside, across Fenny Field Bridge and up the valley to Park Bridge iron works and Rocher Vale coal pit. At first the waggons were pulled by horses but later a small locomotive called the Ashtonian was used. This had to be small in order to pass through two short tunnels with only a six feet headroom. 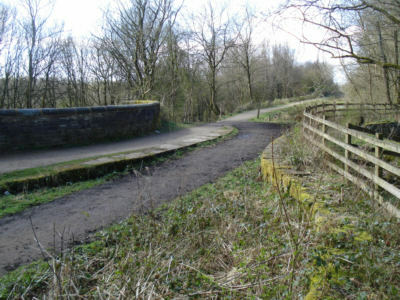 When the Oldham to Ashton railway line was built through Park Bridge, a branch ran down to Rocher Vale and the Park Bridge iron works, making the tram road to Fenny Field Bridge redundant. The abandoned Fairbottom Bobs steam engine. 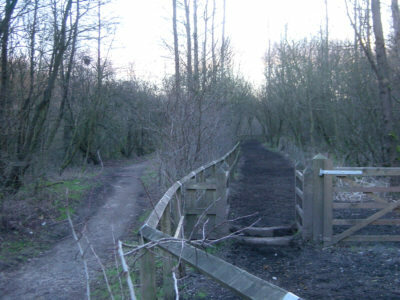 About 200 metres along the former tram road, a footbridge on the left crosses the river to the site of the former Cannel coal pit at Fairbottom. A Newcomen atmospheric steam engine was used here to pump water out of the pit. 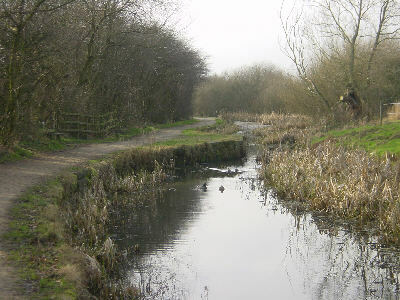 This water was fed into a channel which fed the Fairbottom Branch Canal. This engine was known as "Fairbottom Bobs" because of its rocking motion. When the pit closed the engine was abandoned and became subject to vandalism and the ravishes of nature. In 1929 Henry Ford bought the engine and took it to America. He had it restored and it is now on display in Dearborn Museum. 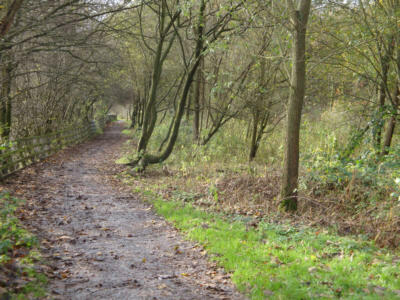 A tram road ran from the Fairbottom pit, along the north side of the river, to the canal west of Fenny Field Bridge. The course of this track has now been eroded away by the river. 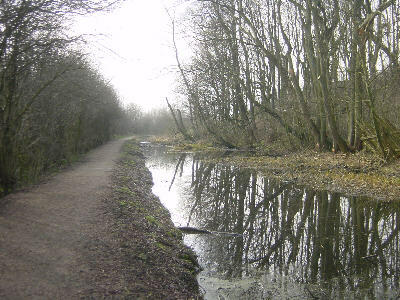 If you are walking the canal route, you can continue along the former tram road to Park Bridge, or re-trace your steps along the Fairbottom Branch to re-join the Hollinwood Branch towards Crime Lake and Hollinwood. You can catch a bus from Bardsley Bridge to Ashton or Oldham.